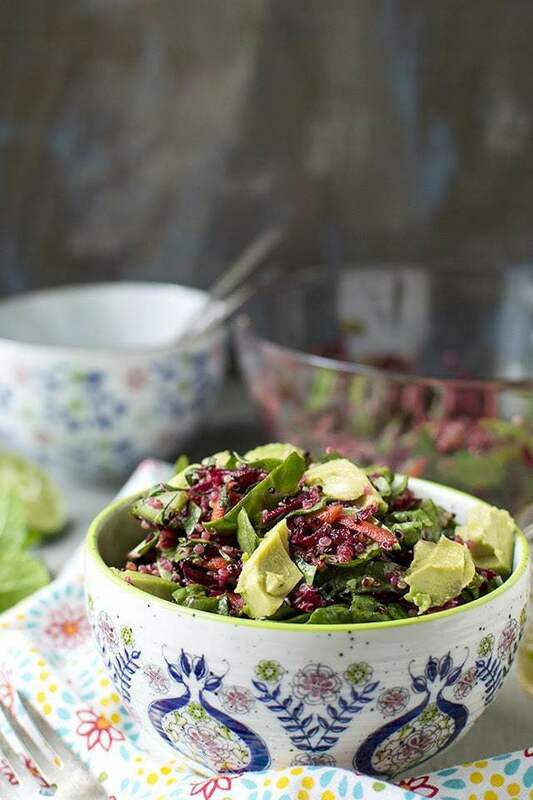 Colorful, filling and healthy salad with beets, quinoa and other super foods. Cook the quinoa: In a small saucepan, combine quinoa and of water. Bring to a boil, lower the heat, cover and cook for minutes or until all the water has evaporated and quinoa is tender. Fluff the quinoa and set aside to cool. Toast almonds or pepitas until slightly golden around the edges. To make the Dressing: Combine all the ingredients for dressing in a small bowl and whisk well. In a large mixing bowl, combine grated beets, carrot, toasted almonds/ pepitas, cooked edamame, chopped spinach/ arugula, avocado and cooked quinoa. Stir in the dressing and gently toss to combine everything. Season with salt and pepper. Serve right away! !